This research project focuses on the recent phenomenon of Open IP strategies and approaches. Examples are the 2014 patent pledge of Tesla Motors following Elon Musk's announcement that everyone can use Tesla’s patents for free. One year later, Toyota followed this approach by releasing 5,680 patents relating to the fuel cell technology. 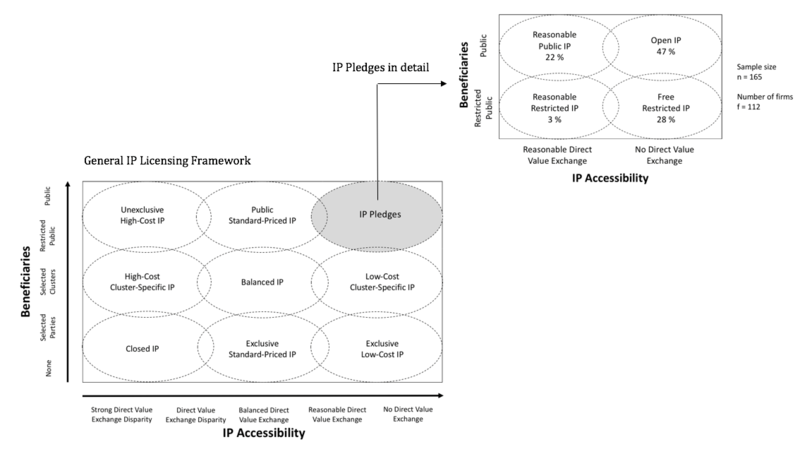 (1) What are characteristics of Open IP strategies? (2) What are motives of firms to adopt Open IP strategies? (3) How do Open IP strategies impact the technology diffusion of emerging technologies? To answer these research questions, we conduct several semi-structured interviews with CEO’s and IP managers around the world. Additionally, we plan to conduct multiple case studies and a web-based experiment. One of the outcomes so far is the ‘IP Licensing Framework’ (see picture). This research will contribute to the existing technology management literature by facilitating the definition and distinctions of Open IP strategies. Furthermore, the outcomes of this research will hopefully help firms to decide whether to adopt such strategies. This project is funded by the Engineering and Physical Sciences Research Council (EPSRC), respectively UKRI and the Research and Development Management Association (RADMA).